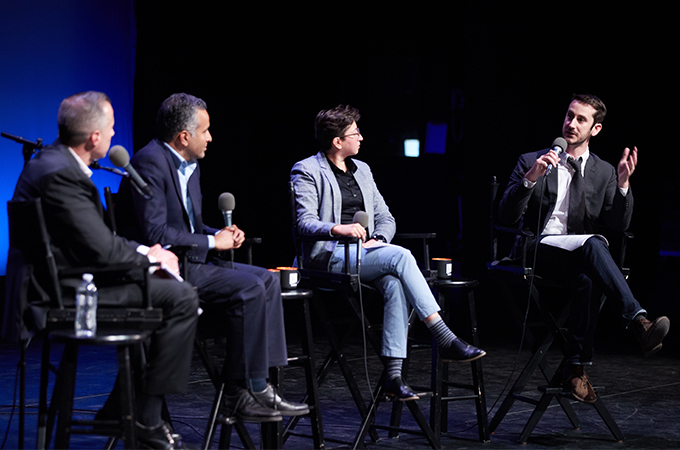 Southern California Public Radio station KPCC recently broadcast a discussion at the University of Redlands that explored the surge in immigration in the Inland Empire and its implications for the region’s politics, economy, and more. U of R economics Professor Nathaniel Cline joined the conversation with Take Two host A Martinez and fellow panelists Italia Garcia, political director of the Center for Community Action and Environmental Justice, and Karthick Ramakrishnan, professor of political science and public policy at the University of California, Riverside. Here are a few edited excerpts from the evening. A Martinez: How many people in the Inland Empire are immigrants? Karthick Ramakrishnan: About a million. To put that in context, about one in every five residents in the Inland Empire is foreign-born. That kind of number is shocking to a lot of people because that's not the dominant image that comes to mind when you think “Inland Empire.” Racially, most people think the Inland Empire is white, but in fact Latinos are the majority. People think of a bygone era, in terms of not only the racial composition of the population, but even what economic development looks like—as a vast region with a lot of space and not a lot of people. It’s very different not only from the Inland Empire that we see today, but what we've been seeing for the past couple of decades. Part of the reason people found our report [“State of Immigrants in the Inland Empire”] so useful is [it gives a] wider lens [with which to view] immigrants and their contributions, not only to the economy, but to society. Immigration is not something new here, especially when you look at the history of agriculture in the region. Martinez: Who are we talking about? Where are they coming from? Ramakrishnan: If you compare who the immigrants look like here versus elsewhere, Latino immigrants are a big part of the story here, just as the rest of the Southern California. But what's interesting is that Mexican immigrants in particular are even more important to the immigrant population in the Inland Empire than they are to the population of Los Angeles County. That, too, breaks a lot of stereotypes. … A lot of the Latinos migrating into this region are second- and third-generation. It’s part of this more general story—people are looking for more affordable housing than they can find in Los Angeles and Orange County. Martinez: When it comes to Asian immigrants in the Inland Empire, who are we talking about? Ramakrishnan: When you look at Asian immigrants in the Inland Empire, what's interesting is the much greater importance of Filipino immigrants here than Chinese immigrants. It's a mirror image of what you see in Los Angeles County. Here, Filipinos are the largest Asian group followed by Chinese immigrants. Martinez: Nathaniel, give us a quick history about what industry laid the foundation for the economy here in the Inland Empire. Nathaniel Cline: Roughly from 1945 through into the ‘70s, we had a high degree of manufacturing, military employees, and steel. It's after that point, after the 1980s, that international competition basically ends the steel industry here. At the same time, we see the elimination of a lot of military jobs and an increase in foreign competition in manufacturing. This is a time when the United States is going through a deep recession, and the Inland Empire and the region as a whole is faced with a choice: How do we survive in a world in which manufacturing jobs have essentially been decimated? The response of the region in many ways was to use the routes that had been established for military transportation to develop the ports of Long Beach and L.A. The idea essentially was if we cannot manufacture these goods anymore, perhaps we can be the center of distribution of our imports from abroad. Since then, we’ve also had the development of healthcare, another large industry in our region. Martinez: How much did just plain space have to do with logistics becoming a booming business? Cline: In a lot of people's minds, there's something natural about the development of the logistics industry here. We are located next to two very busy ports, and we have very cheap space with which to store large containers. But let's also not forget the degree to which the cheapness of the space and the infrastructure that connects us to those ports was the result of active government policy. The Southern California associated governments have for decades been planning the inland region as a center for warehousing. They built the roads, the airports, in order to support that infrastructure. They have gotten federal money to support the two ports of Long Beach and L.A. This was a choice in the face of declining manufacturing. Martinez: When it comes to foreign-born workers, what drew them to the warehouse industry in particular? Cline: The immigrant experience in the Inland Empire is really diverse. There are really strong ethnic divides in industries and in the Southern California region. Immigrants, in particular immigrants from Mexico, were drawn to the logistics industry as there are low educational requirements. However, there's also a way in which the logistics industry played a special role for particularly vulnerable immigrants, those who had undocumented status. Logistics companies were using and continue to use staffing agencies, which hire temporary employees. We know those staffing agencies are generally the place folks can go and know that they will not run into E-Verify or other kinds of roadblocks to getting hired based on immigration status. But, in general, it's the same story: a low-end education requirement in a fast-growing sector. Martinez: Italia, let's start with a little Inland Empire political 101. What’s the story on the congressional, county, and city levels? Italia Garcia: Historically, we saw predominantly the concept of “the good old boys” and white, established a middle- to upper-class folks in elected office. I think that might have a lot to do with the economy, for example, Riverside back in the 1900s was considered one of the richest cities in the country. We did have a high-income population and that reflected in the representatives. Martinez: When did that start to change? Garcia: I migrated here in 2000—I was 10 years old—and I have personally witnessed the change. I think I can pinpoint it to a little before 2010, before the 2010 census, and the redistricting that took place. We really saw a shift in 2012 at statewide congressional leadership, electing the first openly gay, Asian-American to Congress. That was a huge thing for the Inland Empire. Ever since, we've seen a slow but steady shift in the representatives we have, especially on the congressional and state levels. But the county and the local levels do not reflect the demographic changes. Martinez: Everyone wants a good job. Everyone wants to make money, own a home, have a little slice of the American dream. Have there been big differences between the new rising political class and the one that was here before? Garcia: I agree, everyone wants jobs. Immigrants, we like to work. Putting myself through college with two jobs, we're not afraid of hard work. But, if I can also put in the millennial perspective, I think now we're starting to think not just of having opportunity, but of having an equitable opportunity—making sure that everyone not only has an education, but has a quality education, for example. We want to level the playing field and make sure everyone has a shot at the American dream, everyone has a shot at living a good life in the region. I think the difference is not necessarily in the core values of wanting to succeed, but more how we get there. To watch a video of the full conversation, visit the KPCC website. To learn more about happenings at the University of Redlands, see the U of R’s News & Events web pages.